I'm surprised my blog hasn't disappeared with the lack of effort I have put into it lately. I can't believe how time has flown by. I've been off of work now for over two weeks and have seriously, severe, pelvic girdle pain, making it impossible to walk around, move in bed, do anything that requires standing so I sit and wait. 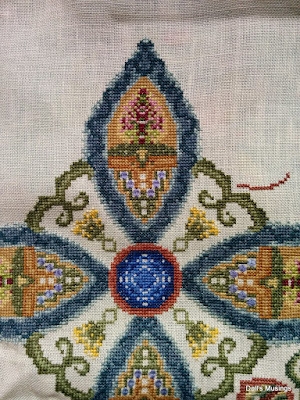 Since I've been sitting around, watching lots of home and garden TV, I've been stitching on Sarah Chapple. I've thought about starting a few new pieces but that would be silly as baby Bean is coming in a few days...I hope! We have also moved a pile of boxes over to my great aunt's house which we will move into July 1st. There's still a lot of work to be done in the house before it's ready, but we are looking forward to it as we will be across the street from my Nana, and in an amazing area in Vancouver, Kerrisdale. Back to my roots! I grew up there until I was 4 and visited every summer until I went to UBC, where I lived with my grandparents for a few years. It's a nice flat, quiet area with shops 6 blocks away. A great place for me and Bean to walk around in and get back into shape! I sure hope this pain goes away as nothing is helping it. I've tried physio, massages, everything, nothing works. I think I'll have to go for the epidural during birth as I won't be able to stand the hip pain. As long as Bean is okay, then I'll do what I need to do. 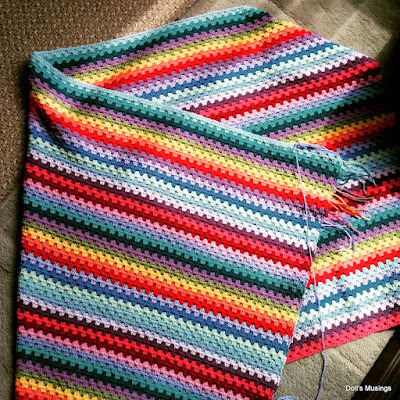 Enjoy some photos of my stitching progress and granny stripe. Sarah Chapple is such a massive sampler. I told my hubby the other day that I probably won't finish her for another year or so with a little baby around. We will see! Some Knotgarden progress. Another massive project that will be put on hold for some time. My granny stripe is coming along. I think I need to add only 11-12 more colours then I can put in a border! 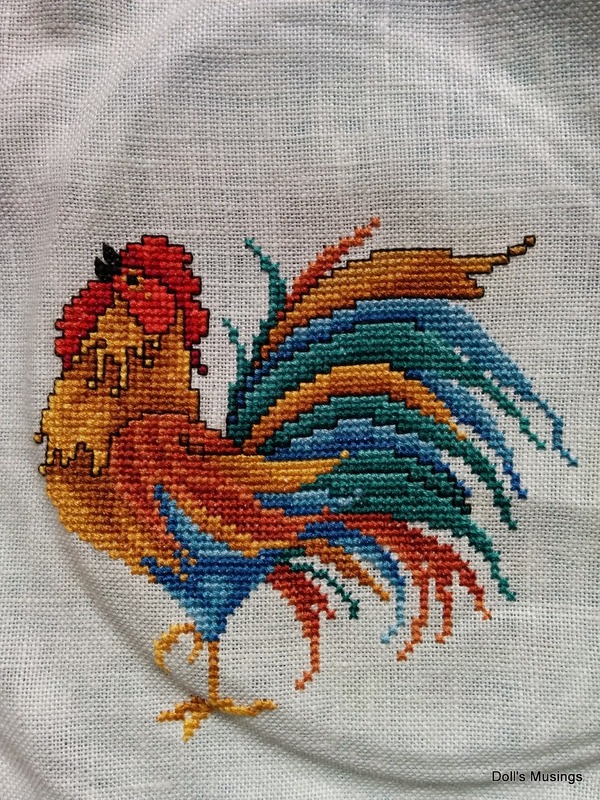 An almost finish on the Rooster I am stitching for my friend's little boy. I have a bit more black stitching to do then it's ready to be framed! He's a very majestic rooster isn't he?! My baby's rag quilt washed and ragged. It's such a soft quilt! A few photos of me, my siblings and Titus of course. A few thoughts on blogging. It feels to me that there has been a decline in blogging, including my own decline in writing posts and commenting. 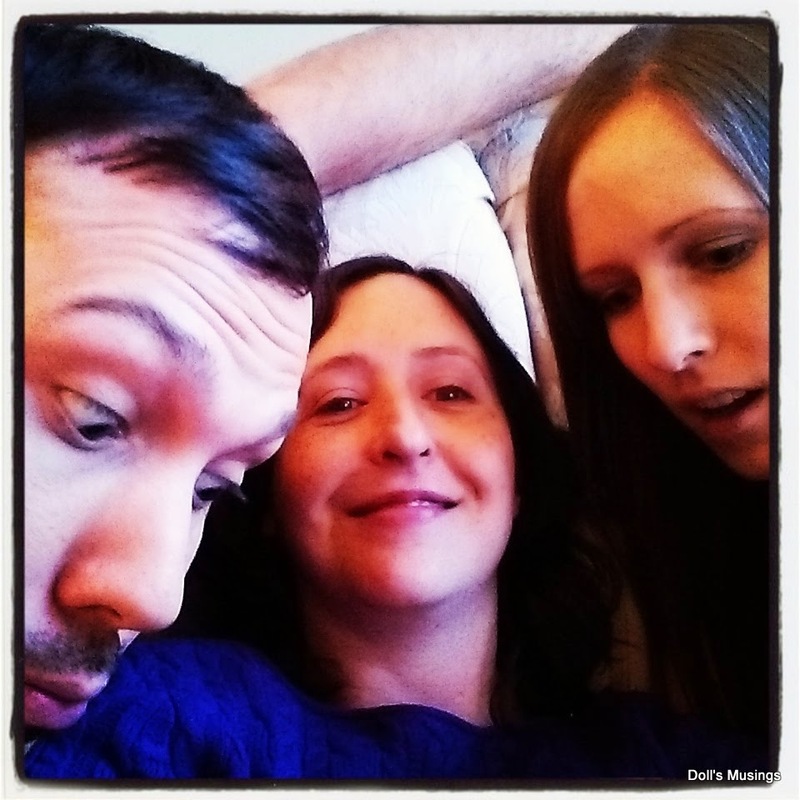 Instagram is where I tend to be as it's quick and easy to post photos and peruse other people's photos. Blogging has been enjoyable however, I feel like it takes a huge effort to post and eats away so much time, of which I know I won't have a lot of very soon! I don't think I'll give it up quite yet but we will see how things go! I will definitely let everyone know about Bean's arrival and if it's a he or she...I think he...but after that, if I don't have any stitching to show, I probably won't post that often as this blog has been more of a great stitching journal for me over the last 4 almost 5 years. Anywho, I hope everyone is doing well, I do miss you all and sorry for being so remiss lately. 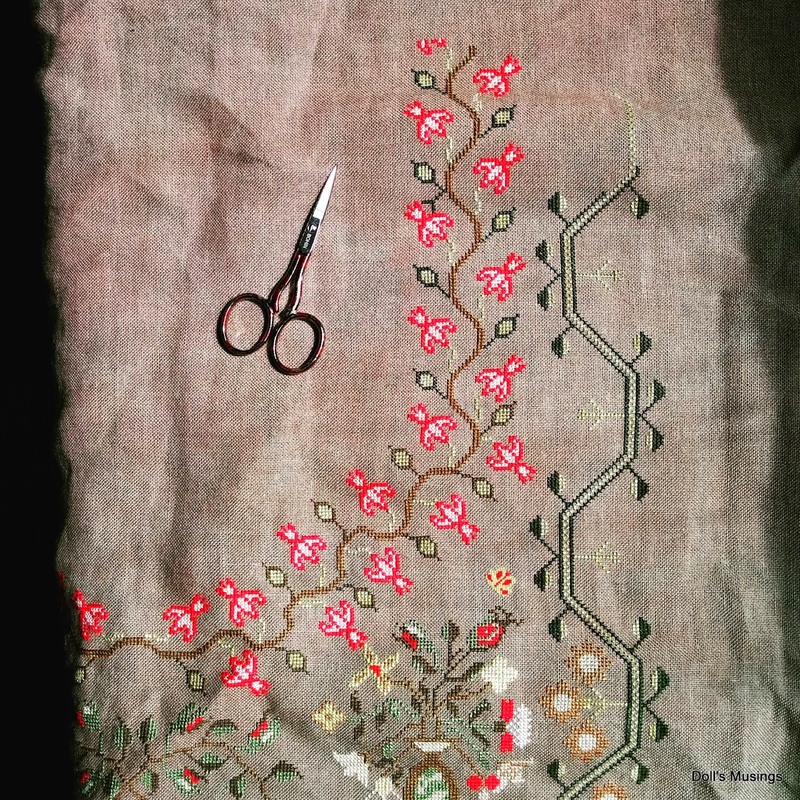 Everything you're working on or have finished is absolutely beautiful - yeah, some projects may have to go on hold, but they'll be there for whenever you feel like putting in a few stitches, and believe me a mum needs some "me" time every now and then. Your really have done some lovely stitching during this time. So sorry you are in pain. Sending positive thoughts for you in the coming days. Yeah.. the blogging thing does seem to be winding down. I'm pretty tired of it myself. Hello, Mama Anne! I'm sorry to hear you are in pain but hopefully the Bean will arrive soon and all will be well afterwards. I'm so glad to hear you will be living across from your Nana's! There's so much within walking distance from there. So glad this will work out so well for you and we'll be able to visit more easily! I understand about blogging. It's true people are going to IG, even more than to FB I think. I am pondering IG (I'm slow) and may head that way too. The sewing crowd seems to be on IG daily! Anyway, all the best to you and we'll hear the great news soon I'm sure! Take care! Wow, the time is near! How exciting. Hang in there with the pain, it'll go away! The baby quilt is so cute! I understand about the blogging slowing down but it took several relatives to get me to start a FB page! So Instagram I probably wouldn't do. Lovely updates on all your projects. Blogg writing/ assembling does take time and would not have been on my list at all when I had our sons. Wishing you all the best for you and your new baby . 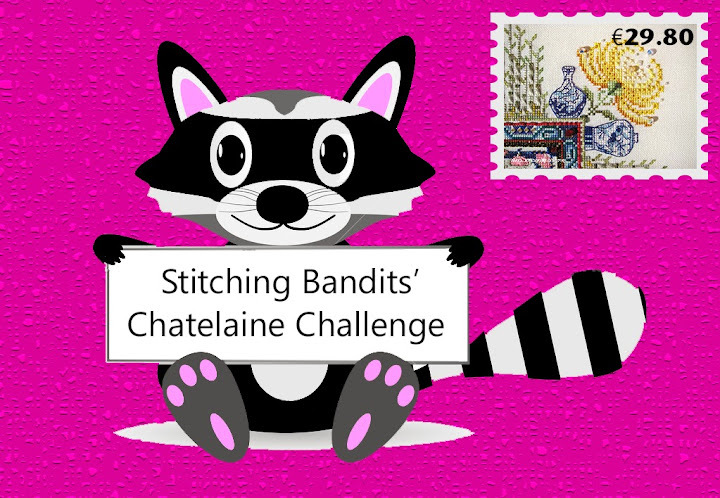 Lovely stitching take care hugs. Lovely projects that your working on Anne. Good luck with the bean. Have you seen a physio Anne - they could give you a pelvic support which does help - I speak from experience and know how debilitating this can be. I look forward to seeing a lovely baby news post soon. Take care. It won't be much longer before your baby makes his/her appearance. 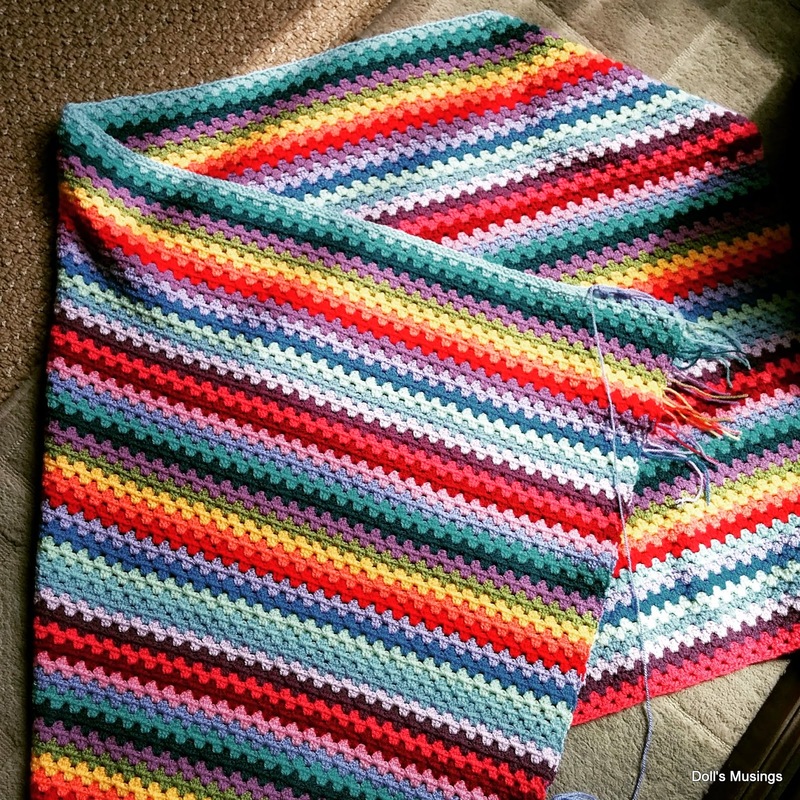 Your projects look good especially your Granny Stripe Afghan and the baby's quilt. Thinking of you! Nooooo, don't go! Blogging is not in decline per se, it's more that some of the older bloggers are not around so much but their place has been taken by newer bloggers. It's still my favourite form of social media because it's the own where you get to know people the best. If you look at my Happy Dance blog you'll easily see the years when the boys were born by the small amount of stitching completed in those years. I doubt I would have had time to blog either! Hope this last bit goes quickly now. Have you looked into getting a TENS machine for the early stages? I had one with my first birth and it was really good, all I needed was gas'n'air in the later stages. Last baby wasn't so good but that was because of the failed induction attempts! Oh I am so glad to read a post from you my friend. I look forward to your announcement SOON! Hang in there. I know about hip pain, I have it daily, but yours WILL go away so very soon. As for blogging, I am in it til the very end. I understand where you are at in life right now. I am praying for you two every day. I think we can all understand why you have not been posting. All your stitching is just beautiful. I am so sorry to hear about the pain you are in, that makes everything more difficult. I was sure my daughter was a boy ! Can't wait to hear what Bean turns out to be! So sorry for your pain and discomfort. Oh I hope you post photos of your precious wee one every once in a while! Hoping your delivery goes smoothly and pain free! Looking forward to baby announcement! I feel the same with blogging, haven't update my blog for more than a year ha ha! You look great. Baby bean will be here soon and the pain will be gone. You are working on some amazing pieces. 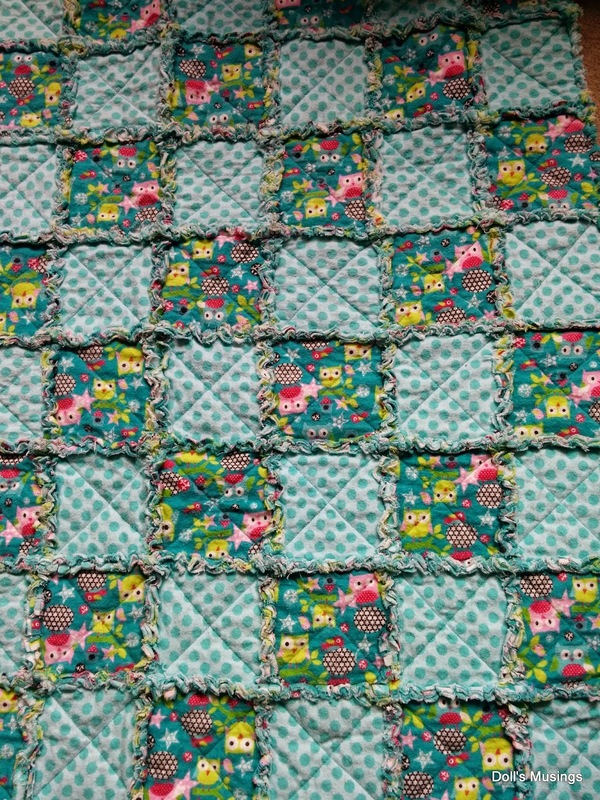 The baby quilt is just adorable. I hope you don't stop blogging. I don't do instagram. My blog is my journal. I like looking back at it if i need a time line. A blog is more personal, it does take a little more time. In hopes of a speedy delivery for you. I love reading blogs. I feel I get a better sense of the person from their blog. Some that I look at are just photos but that is great. Instagram I am not so keen on as a picture might tell a 1000 words but are they the ones you want to say. My blogs are my journals and record of my life. I hope you keep blogging. a photo of bean every day only takes seconds especially using the blog apps. Sarah Chapple is beautiful! Stitching time does tend to go out the window with a little one, even more so when they get mobile! Soooo wonderful to see your post. I truly hope you don't give up on blogging. Of course there will be no time once your baby arrives. Maybe just once in a great while. I don't believe either that bloggers are going away. I'm in till the end...lol! 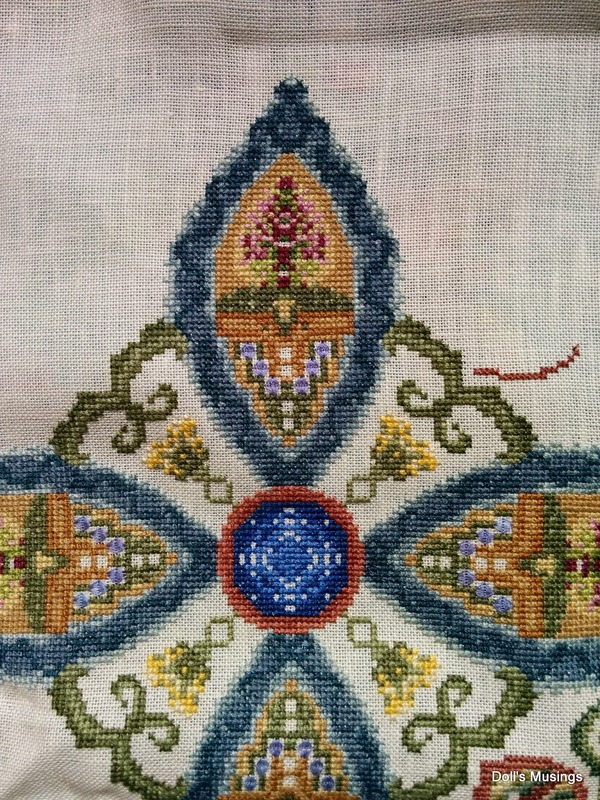 Congrats on all your beautiful stitching progress on your gorgeous wips. I'm on IG also but its not the same as blogging. So happy that your going to be living close to family. Especially your Nanna! Don't go! I love reading blogs and getting to know bloggers all over the world. I suffered with pelvic girdle pain with baby no 2 and it was pretty horrendous. I was told that in 90% of cases the PGP disappears immediately after giving birth so I hope you fall into that category. Keep all your options open for childbirth and just go with whatever feels best for you. Wishing you a safe and healthy delivery very soon! Wow is it really so soon. I do hope your pain goes away. 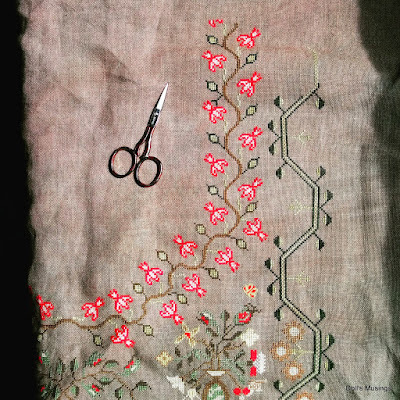 Beautiful stitching. I'm sure we all understand that blogging will not take priority, :), but I hope you will check back now and again. Best of luck! How wonderful to hear you'll be getting out of the apartment! The new place sounds like it will be perfect for you and your Bean. Kudos to you for not finding out if it will be a s/he! I don't think I'd have the will power haha. Blogging does take a lot of time. I don't have a problem rambling on my own blog but visiting others and leaving comments takes hours! But I've been blogging for nearly 13 years now ("life" blog is elsewhere). I think it's okay to disappear from the world once and a while though I will miss your happy posts and silly Titus pictures! Wow I can't believe it's almost time for Bean to make an appearance! I do hope your hip pain goes soon. I do hope you will keep on blogging even if it's only once in a while. I know it can be hard sometimes even without a baby and new home keeping you busy but it's a great community. I've often thought of stopping but I'd miss the friends I've made. Your stitching and quilt are beautiful. Hello again! First of all, I echo everyone else in saying that only the best is hoped for you in the delivery of Baby Bean and getting rid of the hip pain! And then there are your progress photos... you are getting so much more done than me! The sampler is wonderful and I especially love the baby rag quilt!! REALLy like that! If you can't blog but every so often, we understand... but do try! I am remiss a lot lately, due to too many medical things coming along! but maybe it will stop soon! Kisses and Hugs! All the best to you and Baby Bean. Or is he/she already in this world? I am looking forward to hearing your news and I hope you will spread it here on your blog as I don't do IG or FB. Hope everything goes well for the next few weeks and the birth - I will be thinking of you. I hope you've been enjoying a restfull couple of weeks and getting plenty of stitching in. I hope all is well with you, and by now you have a sweet little baby in your hand, or is it still to early? Your have been busy, and how great you have a new house. Enjoy it, I can imagine you will make it in to your home soon. The pain I hope it will be gone soon. You have some beautifull pic's. We see more and moe people go on blogland. You need to do what you want. 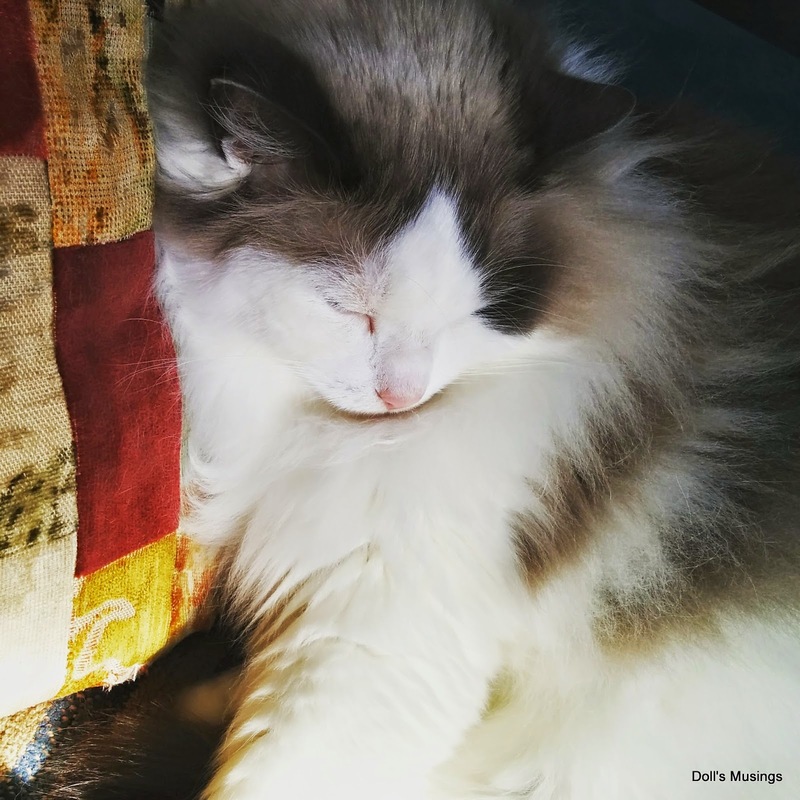 We all love your blog, but you have to keep it on for yourself, not for us. i speak for myself, I always love love to real and see your blog. I don;t have instagram ( really) I need to make a account. Looking forward to hearing about your new arrival. Nice stitching. That piece is so colorful. Just pops off the fabric. I agree with you about the blogging. I noticed comments have dropped off tremendously over the past year.